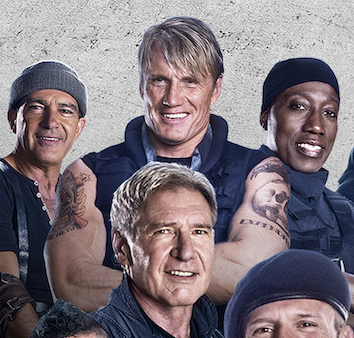 Earlier today saw the release of the UK poster for the upcoming Granddad-action movie The Expendables 3. It comes in two forms. The 1-sheet( portrait one ) and the quad ( landscape ). Most of this post will be talking about the 1-sheet. When I first saw it I was shocked. 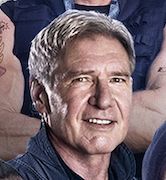 It’s one of the worst bits of photoshop for a poster I have seen in quite a while. It looks like that everything that could go wrong has done. Strange differences in colours of faces, strange while haloes around some people and some of the cast have strange sized heads. The best has to be Mel Gibson, who seems to have done something wrong to be shoved to the sidelines. Not only that. You can easily spot who who the A-listers are and the not so famous people are shown. I wonder who could be the 3 main stars in the film? Could it be Arnie, Jason Statham and the woman ( Ronda Rousey ) the other side? Finally, who on earth thought it was a good idea to arrange the cast that way. It just looks like they have put them onto the image and then just put them anywhere the felt like it. More famous people are more obvious than the 80s mega-stars. A good example of this is the one I mentioned earlier about Mel Gibson. According to the synopsis he’s meant to be the baddie. Why didn’t they put them in the order that they appear on the credits? Start with Sly then circle out from there. then they, probably, wouldn’t have done the strange bobble-head syndrome that some of the people have. Not only that. Look at Dolph Lundgren. He seems to be twice the size of the people standing next to him! Below is the poster of my ire. See if you can spot any more crimes that the ones I mentioned above. The comments are always open for your views. Just click on the image to see a bigger version. I have to mention that there are two version of the poster available. The other being the quad. This one isn’t nearly half as bad as the 1-sheet. Saying that, it doesn’t require much to be better! It still suffers from odd head syndrome and strange colouring. There isn’t as much of the Photoshop halo that most of the people are suffering from in the 1-sheet. Well, apart from Antonio Banderas that is. 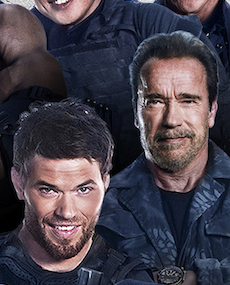 In THE EXPENDABLES 3, Barney, Christmas and the rest of the team comes face-to-face with Conrad Stonebanks (Gibson), who years ago co-founded The Expendables with Barney. Stonebanks subsequently became a ruthless arms trader and someone who Barney was forced to kill… or so he thought. Stonebanks, who eluded death once before, now is making it his mission to end The Expendables – but Barney has other plans. Barney decides that he has to fight old blood with new blood, and brings in a new era of Expendables team members, recruiting individuals who are younger, faster and more tech-savvy. 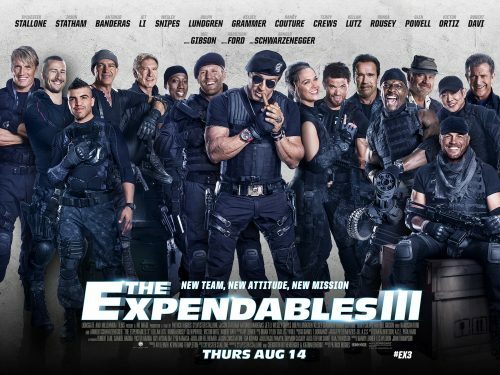 The latest mission becomes a clash of classic old-school style versus high-tech expertise in the Expendables’ most personal battle yet.